Research Methods for Construction will help you instil rigour into your problem-solving, and into your reports and publications. It will be of value to construction, surveying, architecture and civil engineering students undertaking research, whether for bachelors and masters degree dissertations, or for masters and doctoral research degree theses. 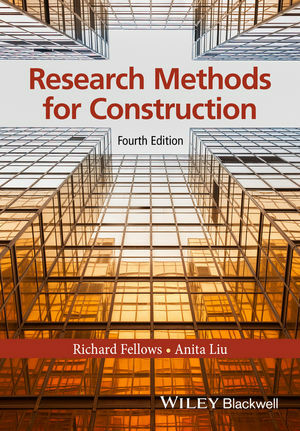 Now in its Fourth Edition, this remains one of the few books to provide guidance on research formulation, methodologies, and methods specifically for construction students. Three main sections – Producing a Proposal, Executing the Research and Reporting the Results discuss the key issues in research and examine the primary approaches, both qualitative and quantitative. The methods adopted for scientific and engineering experiments, model building and simulations are discussed, as well as those employed for research into management, social and economic issues. The authors examine the requirements for data and analysis, including the important statistical considerations and a range of qualitative techniques that enable construction researchers to appreciate what needs to be evaluated in devising how research may be carried out effectively and efficiently. This new edition has been updated to reflect current debates and concerns, including ethical issues, legislation and codes of practice concerning the collection, processing, storage, use and disposal of data. Pressures of time and funding to carry out the empirical work all too often lead to a lack of attention to how the study should be done and why. The authors address the importance of explaining the philosophical approach adopted (ontology, epistemology) and the consequent methodology. They advocate close scrutiny of the methods available for appropriateness, both academically and practically. The fundamental theme of the book remains to facilitate a researcher’s informed and justified selection of a philosophical paradigm and of appropriate methods to execute the research. Richard Fellows is Professor of Construction Business Management at Loughborough University, UK; previously, he was a Professor in the Department of Real Estate and Construction, The University of Hong Kong and Professor of Culture in Construction at Glasgow Caledonian University, UK. ?He graduated from the University of Aston and has worked as a quantity surveyor for several major contractors. ?Richard has a PhD from the University of Reading, has taught at a number of universities in UK and other countries and was co-ordinator for research in construction management for the Engineering and Physical Sciences Research Council in the UK. ?His research interests concern economics, contracts and law, and management of people in construction - especially cultural issues as drivers of behaviour and performance. ?He was a founder and for many years was joint coordinator of the CIB group, W112 - 'Culture in Construction'. ?Richard has published widely in books, journals and international conferences and is qualified as a mediator. Anita Liu graduated from the University of Reading.? She returned to Hong Kong to work in a quantity surveying consultancy, for the Hong Kong government, and for a major contractor before moving into academia. She obtained an MSc and a PhD from the University of Hong Kong. She has obtained many research grants from different awarding bodies, including ESRC (UK) and RGC (Hong Kong) projects and has presented papers at many international research conferences. She publishes widely in a variety of leading journals, is a regular reviewer for international journals and research awarding bodies, and is a member of several editorial boards. Anita has been chairperson of the Quantity Surveying Division of the Hong Kong Institute of Surveyors and a member of committees and boards in various professional institutions in China and in UK. Anita was chair professor of Commercial Management and Quantity Surveying at Loughborough University. Currently, she is Professor in the Department of Real Estate and Construction at The University of Hong Kong and joint co-coordinator of CIB W112: 'Culture in Construction'.